Sculpins, as a group, have flattened bodies, large mouths and enlarged pectoral fins. They have large heads that taper abruptly into the rather slender body. They lack scales. The grotto sculpins of Perry County look much like the closely related banded sculpin, but they have smaller eyes, paler bodies, and other features fitting them for cave life. The overall color is light tan to bleached tan, with underparts unpigmented. Video of grotto sculpin in the wild. Grotto sculpins live in and around 5 caves and one stream in Perry County. Like their more pigmented relatives, they are bottom-dwellers. Land use around sinkholes has a profound impact on ground water quality and sculpin health. Sinkholes supply water to cave streams and groundwater sources. This makes sinkhole pollution control imperative. Establishing a buffer of trees and other plants around sinkholes reduces soil erosion and filters out herbicide and pesticide runoff. Sculpins as a group have very large mouths and are able to swallow prey items (including other sculpins) nearly as large as themselves. In cave systems and their spring openings, food includes cave isopods and amphipods, crayfish and many other bug-like creatures, as well as small fish. Occurs only in certain caves in tributaries of the Bois Brule River drainage in Perry County, in southeast Missouri. 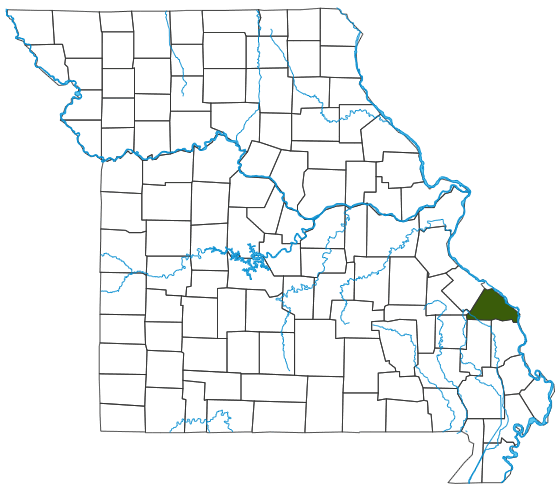 A Federal Endangered Species found only in a single area in Missouri. In 2013, genetic testing determined that the grotto sculpin was different enough from the banded sculpin to deserve its own scientific name. It is a rare fish with a very limited distribution, meaning it is very vulnerable to extinction. Because the water in their caves comes from sinkholes and through porous rocks above, land use easily impacts their water quality. The new species name, "specus," refers to its cave habitat. Biologists are still learning about the life cycle of this species. Mating occurs in spring. The male cleans and excavates a nest under a rock, then courts the female. Eggs are deposited on the underside of the rock. The male guards the eggs until they hatch. A recent study suggests that young grotto sculpins often spend their first season at “resurgence sites” outside of the caves, in order to grow more quickly before reentering the caves, where larger sculpins might otherwise eat them. The grotto sculpin is valuable as an environmental indicator. Its presence indicates that the caves it inhabits have clean water. As long as grotto sculpins thrive, southeast Missourians can rest assured that groundwater supplies in the area are healthy. Caves have their own suite of predators and prey species, and grotto sculpins are predators in these pitch-dark streams, swallowing insects, smaller fish and crustacean-like creatures.